A part of Sofitel’s celebrated MGallery Collection, the Hotel Papadopoli Venezia is a lovely romantic getaway hidden within the heart of Venice. Romance is part of the hotel’s very essence. When the entrepreneurial Count Spiridione Papadopoli purchased the building during the early 19th century, he transformed it into a beautiful palace for his young wife, Teresa Mosconi. Papadopoli also constructed a delightful park adjacent to the building, known as the Papadopoli Gardens. For many years thereafter, Papadopoli and Mosconi hosted dozens of resplendent, romantic parties on the grounds for the affluent in Venetian society. However, during the 20th century the Count sold the location to the city of Venice, who later tore much of the garden down for a new canal. The city also transformed the palace into a municipal building. Around the same time, hoteliers built a hotel on what remained of the Papadopoli Gardens, continuing the legacy of Count Papadopoli and his wife. Recently, Sofitel acquired this exquisite building, rechristening it as the luxurious Hotel Papadopoli Venezia - MGallery by Sofitel. Hotel Papadopoli features 96 lavish rooms designed to reflect the finest architectural aesthetics of 18th century Venetian culture. Guests desiring to live in luxury may select from one of the hotel’s many alluring suites, which offer the best modern amenities, as well as some of the greatest views of downtown Venice. In the building’s Winter Garden resides the Giardino D’Inverno, Hotel Papadopoli's romantic Mediterranean restaurant, which serves its guests delicious Venetian cuisine. Guests can also host private events at the hotel with the Tolentini Meeting Room available for small receptions. For larger events such as weddings, the hotel provides picturesque accommodations within its stunning Winter Garden. Situated within Venice’s oldest neighborhood, the Santa Croce Sestieri, Hotel Papadopoli Venezia - MGallery by Sofitel places guests at the ideal jumping-off point for a journey into one of Europe’s most historic cities. Designated as a UNESCO World Heritage Site, Venice has much to offer travelers interested in immersing themselves deep into Italian history and culture. 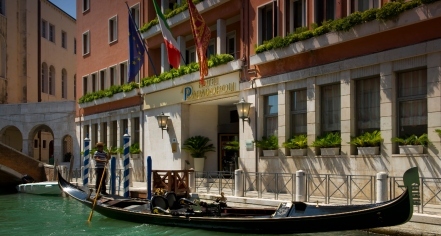 Guests can take a gondola ride straight from Hotel Papadopoli into the Grand Canal. From there, guests can visit many of the famous landmarks that dot the Venetian landscape. Both the Scuola Grande di San Rocco and the Scuola Grande dei Carmini are nearby, containing some of the most beautiful works of Italian art in the whole city. Guests can also travel to the Santa Maria dei Frari, and gaze upon the famous Assumption of the Virgin adorned inside. And by way of the famous Rialto Bridge, guests can walk to San Marco Square where the San Marco Basilica and the Doge’s Palace dwell. A stay at Hotel Papadopoli Venezia - MGallery by Sofitel is guaranteed to make every sojourn into Venice a memorable one. 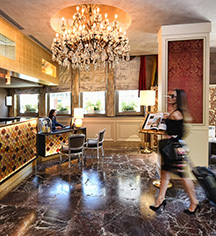 Hotel Papadopoli Venezia - MGallery by Sofitel, a member of Historic Hotels Worldwide since 2018, dates back to the 18th century. Before the building became a luxury hotel, it operated as part of a massive convent at the center of the Santa Croce neighborhood. Deposit: All stays must be guaranteed by credit card. Early Check-In/Late Check-Out: Early check-in available from 10:00 a.m. and late check-out available up to 4:00 p.m., charges apply. Parking: Public parking is available nearby, charges apply. Learn more about the History of Hotel Papadopoli Venezia - MGallery by Sofitel .